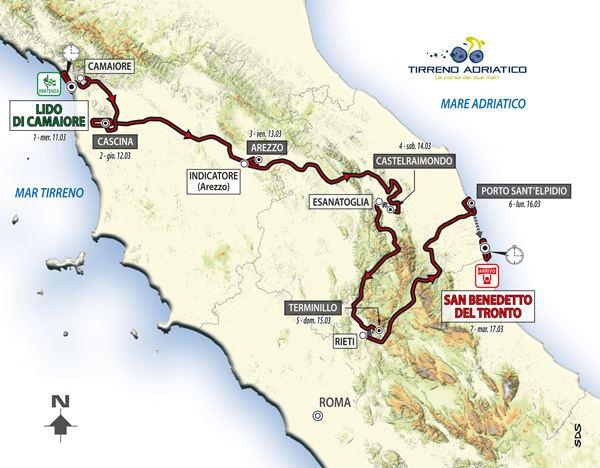 Organisers RCS Sport revealed on Thursday the course for the 2015 edition of the prestigious week-long stage race, Tirreno-Adriatico, including a tough mountain top finish on Monte Terminillo on stage five. The race will run its 50th edition between March 11 and 17 next year, and is likely to continue to attact many of the best riders as it acts as a prelude to the classics season and those looking towards the first grand tour of the year, the Giro d’Italia. Britain’s Chris Froome (Team Sky) and two-time winner Vincenzo Nibali (Astana) will take part in next year’s edition, while defending champion Alberto Contador (Tinkoff-Saxo) will return to defend the trident trophy along with compatriots Alejandro Valverde (Movistar) and Joaquim Rodriguez (Katusha). The race will begin with a 22.7km team time trial before moving on to a flat stage and a stage that will suit the puncheurs, which features the same uphill finish in Arrezzo that saw Peter Sagan pip Michal Kwiatkowski to the line in 2014. The fourth and fifth stages of the Race of the Two Seas will take the riders into the mountains, with for KOM climbs along the route of stage four. 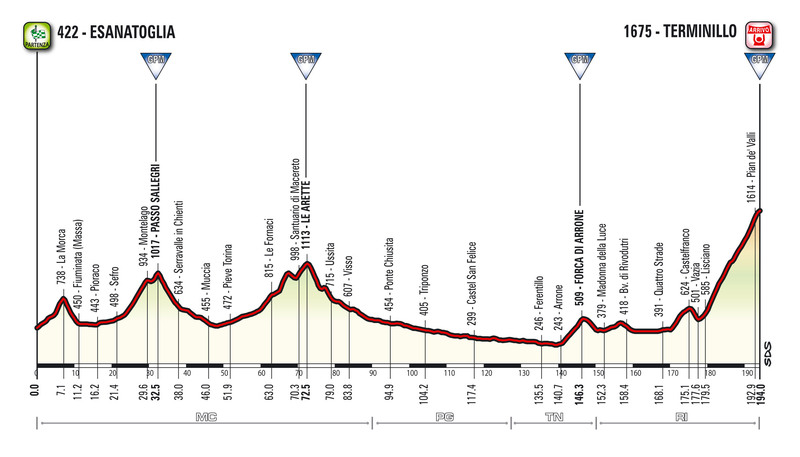 The fifth day is the WorldTour race’s Queen stage, with riders taking in two mountain climbs before a summit finish on Monte Terminillo, at an elevation of 1,675m. The sprinters will then see a second chance for a stage win on the 210km penultimate day, before a 10km individual time trial that could play a deciding role in who will walk away with overall win and the blue jersey. Tinkoff-Saxo rider, Daniele Bennati, who was in attendance for the route presentation, said he was looking forward to helping Contador and Peter Sagan to win on the course. “During the race my role will be to protect my captains, Contador and Sagan,” he said. Race director, Stefano Allocchio also spoke at the presentation on Thursday morning, and was pleased with how Tirreno-Adriatico’s stature has grown to be able to attract the best riders. “For 2015 we created a course that, as in previous editions, will test every type of rider,” he said.